Coach Cam made a big recruiting splash for the women’s team this week with the commitment of 6’1” guard Lavender Briggs. 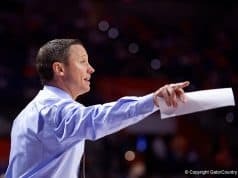 An athletic guard who plays with great intensity Briggs is the 48th ranked player in the 2019 class and is the highest rated recruit Coach Cam has welcomed to Gainesville. 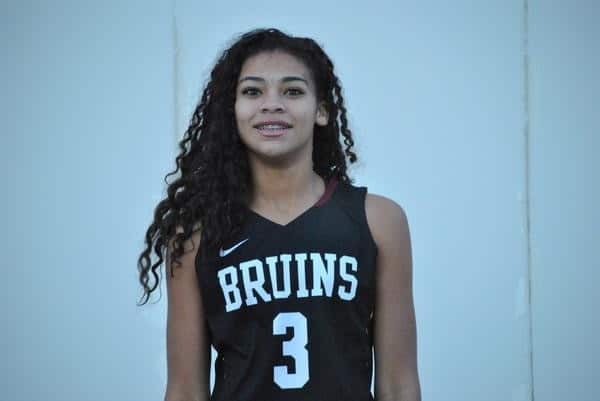 With good length and physical ability in the backcourt, Briggs is certain to bring an impact immediately with the skill to help on both sides of the ball and in any position she’ll be asked to contribute to. Her basketball sense and court IQ is a perfect compliment to her regular hustle and her nose for where the ball is headed is evidenced by the 11.2 rebounds and 3.4 steals she averaged last year for Provo High School in Utah. I was lucky enough to speak with her about her game, her favorite players, and what you’ll find her eating before a game. EF: Thanks so much for doing this! First off, can you tell us all where you’re from and then tell us a bit about your basketball journey up until this point? LB: Okay. I was born in Newburgh, New York and moved to Utah when I was about 8. When I was little I would go to the outside courts with my dad and brothers to shoot and play basketball. When we moved to Utah I played on a little league program and my mom was always the coach and had me playing two grades up with the older girls. After that, when I was a little bit older I played on an AAU team called Utah Stars and we traveled everywhere and played against the best AAU teams. When I was in 9th grade Coach Keith from Colorado Premier had me play on his EYBL team and I got recruited! EF: Your impressive AAU career lead to you getting some incredible offers from all around the country including, of course, Florida (laughs). You’re the highest ranked player Coach Cam has landed at Florida. What was his vision for you and what ultimately got you, a New Yorker relocated to Utah and playing for a Colorado AAU team, to be a Gator? LB: His vision for me is to be great and win a title and national championships during my time at Florida. I’m just going to go in and perform the best I can. He has a lot of confidence in my game, as I do in his coaching. Hopefully I make some noise my first year so we can get some more top recruits. 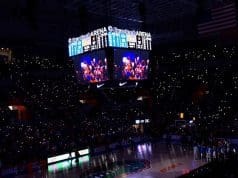 As of why I chose to be a Gator…Florida’s not a bad place to be and I loved the energy and vision from the coaches, so it felt like the place to be. EF: That’s awesome, I’m glad you made the choice to be a Gator! In terms of your game on the court, how would you describe yourself as a player? LB: Thank you! 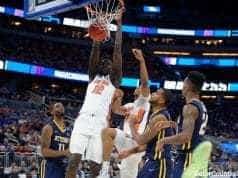 As a player I’d probably describe myself as active on defense, like playing fast and shooting a lot but can get my mid-range off quick and get to the rack when necessary. Most importantly, I like to win! EF: I appreciate you talking about defense first but I also think you might be selling yourself short. You scored a LOT of points in high school last season (25.1 points per game) and filled it up for Colorado Premier too. What side of the game, defense or offense, came easier to you and which side did you have to work on more to develop? LB: Defense definitely comes easy to me and I enjoy it! I’d have to say I work more on offense, because I’m constantly working to improve my shooting, ball handling, and the moves in my arsenal. But I’m always looking to develop both sides of my game! EF: Is there a particular element of your game you’ll be focusing on this upcoming season as you prepare to transition to the college game? LB: Everything, really. Quicker, more explosive moves, finishing at the rack harder, and a quicker shot release. EF: If your release gets even quicker than it is now then defenses are going to be in trouble (laughs). Do you have a favorite player or one you try to model your game around? LB: (laughs) That’s what I hope for! A few people I like are Kyrie Irving, Russell Westbrook, and Jayson Tatum. EF: I don’t think there is anyone more fun to watch with the ball in their hands than Kyrie Irving! What are your long-term goals with basketball? LB: Yeah I agree! Hopefully to play professionally overseas. EF: There are some great places to play over there, that’s for sure. Thanks so much for doing this Lavender! EF: I want to end with some rapid-fire questions. You can answer with as many or as few words as you want. What is your favorite shoe to play in? EF: Favorite meal when it’s not basketball season? EF: Artist you’re currently listening to? EF: favorite place you’ve travelled to play basketball? EF: Non-athlete you’d like to hang out with? EF: Biggest hobby or passion outside of basketball? EF: Pre-game pickles! I love it! (laughs) And I hope sometime you treat yourself to something other than salad when you’ve got some time away from basketball (laughs). Thanks so much for doing this! I’m glad Gator fans will have the chance to get to know you a little bit more. LB: Oh yeah, gotta have the pickles! (laughs) Thanks for wanting to do this, it was fun! EF: It was my pleasure! You can follow Landender on Twitter and Instagram at @lavbriggs.